Leading architecture and interior design practice, Michaelis Boyd, has just completed the design of Chef Andrew Wong’s hotly anticipated new restaurant, Kym’s. Located in the Bloomberg Arcade, at Bloomberg’s new European headquarters, Kym’s is a contemporary Chinese restaurant with a relaxed yet sophisticated interior imagined by the global design firm’s London team. Michaelis Boyd have designed the interiors for the 120-cover restaurant and bar which is spread over two floors with street level access onto the heart of the Square Mile. The design concept harmonises eastern and western sensibilities to create a vibrant and timeless space inspired by traditional Chinese motifs and materials reinterpreted in a contemporary way. The modern setting reflects and pays homage to traditional Chinese cuisine, and Chef Wong’s creative culinary flair. The main dining area of Kym’s is a nod to the theatricality of food and fine-dining. Set on the ground floor the space features an open kitchen and statement curved bar at its heart, creating an instant energy on arrival into the restaurant. The interior design features a soft colour palette of blush pinks and deep plums, with accents of copper and turquoise mixed with dark wood and a sunken terrazzo floor speckled with green marble chips. The exposed timber structure from the mezzanine overhead and natural plaster walls have been used for their natural subtle pink tones, while verdigris and plum tones are used in a mix of materials including leather, suede and velvet to enhance a sense of textural warmth. Decadent furnishings and lighting create a welcoming atmosphere with crushed velvet seating by the bar, stained walnut, brass and leather Utility dining chairs by Neri&Hu; while brass and holophane glass wall sconces project intricate shadows onto the textured walls. Low backed banquette seating runs the perimeter of the restaurant, enclosing the restaurant space as ‘the stage’. Custom antique glass mirrors reflect the bustling activity from within the kitchen while the white Carrara marble tables allow the colourful food to take centre stage. The bar for counter dining is also made from white Carrara marble and is clad in a large panels of dramatic verdigris copper. The semi-circular sunken bar is covered in reclaimed turquoise roof tiles and is positioned beneath a dramatic cherry blossom tree that has been centrally located so it can be viewed in the round. 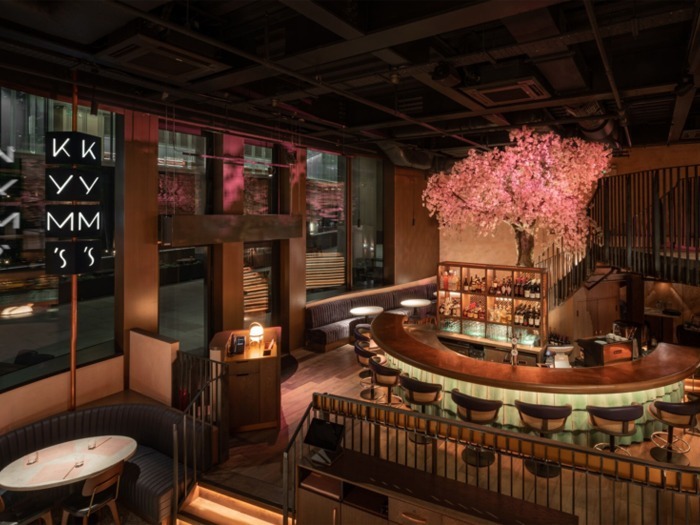 A copper bar top reflects the weeping pink blossom overhead and the bar stools feature comfortable cane backs and deep plum leather seats. A raw milled steel staircase with oak treads curves around the bar with the majestic bespoke cherry blossom tree at the centre casting soft shadows onto the natural plaster walls and across the dining space. Signifying female beauty and female power in China, the tree represents the yin element to the yang of the present day corporate City of London, helping to harmonise and balance the interiors. The curved sweeping staircase connects the bar and restaurant with the mezzanine level, offering views over the restaurant and provides an alluring backdrop for passers-by and guests to enjoy. The upper floor has a notably more intimate and epicurean feel. A row of finely ribbed velvet fixed seating overlooks the theatrics of the main double height restaurant space, directing focus with the aid of dining shelves cantilevered from the steel balustrade. A backdrop of antique and stained oak custom mirrors, half-height oak paneling with natural woven paper inlay, perforated copper and handblown turquoise glass lantern wall lights all create a more intimate dining ambiance in this upstairs space. A luxurious soft linen curtain can also enclose the mezzanine space for private dining or events, providing an added sense of exclusivity.